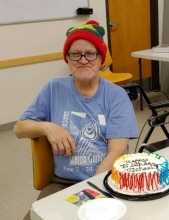 Michael Lang, age 84, of Fort Wayne, Indiana, passed away Friday, February 1, 2019. Michael was born December 8, 1934 in Toledo, Ohio, to Michael Lang and Katheryn Buerkle Lang, both deceased. He had worked for many years at the Fort Wayne Country Club and the Fort Wayne Parks and Recreation Community Center. He is survived by sisters, Evelyn Wolff of Florida, Esther Farr of Florida, and a brother, Frank Lang of Ohio, and his many friends at the Community Center. A Graveside Service will take place Monday, February 11, 2019 at 9:00am (CT) at Oak Park Cemetery in Knox. To send flowers or a remembrance gift to the family of Michael Lang, please visit our Tribute Store. "Email Address" would like to share the life celebration of Michael Lang. Click on the "link" to go to share a favorite memory or leave a condolence message for the family.